The day is meant to sleep longer, relax, swim or whatever you feel like doing after a week of cycling with quite a demanding schedule. There would be plenty to see in this rather popular seaside resort, but it is entirely up to you. The plan is to stay in the area until the late afternoon or early evening. Then, it is time for something new. 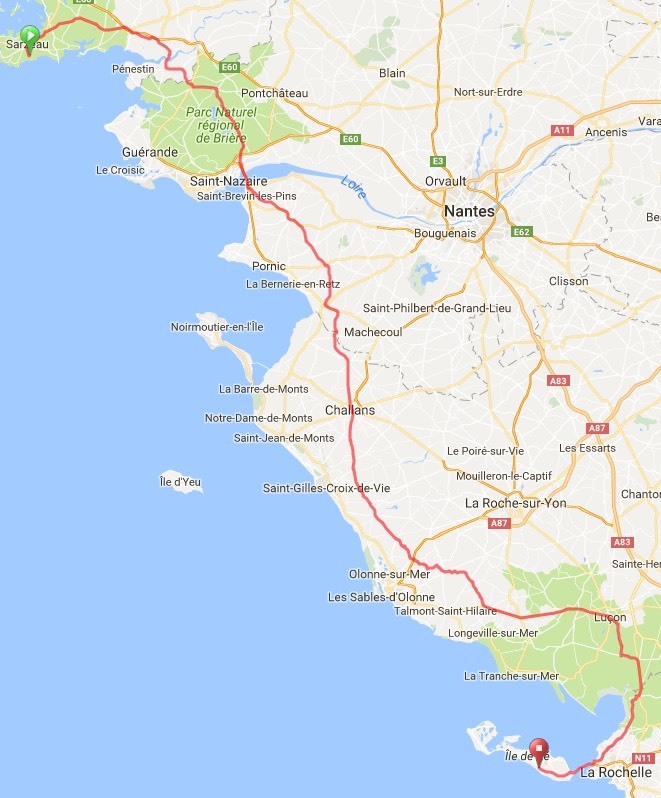 We will ride into the night and through the night all the way down to another very scenic and popularf spot on the Atlantic: the Ile de Ré. The island is famous for its beaches and little villages (best explored by bicycle). The main town St Martin is very pretty and worth a visit with its many cafés and restaurants, a pittoresque harbor and a majestic fort, which is listed as a UNESCO heritage site. Riding should be easy, a bit hilly in parts but nothing spectacular. Route is along side roads with a preference for the faster options in several places (as it will be dark anyway). At Chasnais, home of the largest velomobile store in France, we will likely have a night stop for tea or refreshments (and the option for some quick repairs if needed). Instead of going into Nantes, the route has us take a ferry across the Loire river at about 120 km into the ride. Ferry closes at 20:30. Should you get there later, you can follow an alternative route into Nantes and across a bridge. 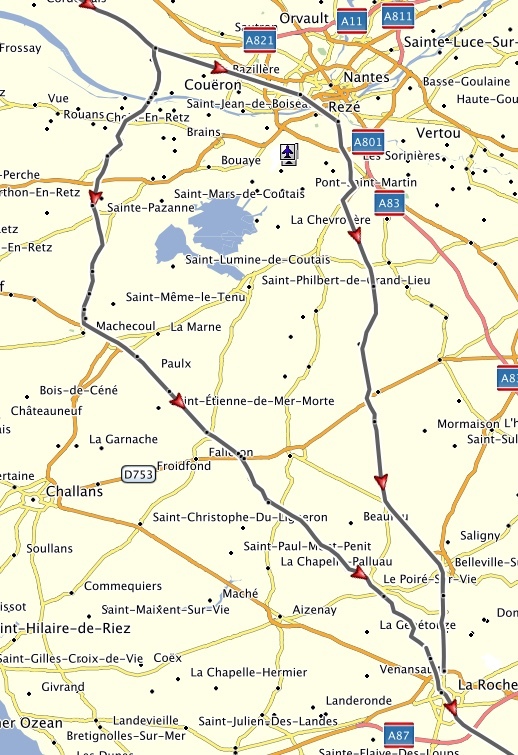 The track rejoins the original route about 80 km after the split; altogether the alternative route is not longer than the ferry route. See the map to the left showing both options. In the early morning hours, as the sun rises in our back, we should be crossing the 3 km long bridge over to the island. Watch out for the bike trail across the bridge – it is on the right side of the bridge as we approach it. To get onto the trail requires some attention as there is also a péage right before the bridge. Once on the island, a few km down the road is the campsite. The arrival ritual of a night ride calls for a dip into the sea before you go napping on the beach until the campground opens. Note: The day has been reworked to take out some deviations. Thus, the track slightly differs from the map as shown above. The route has been checked against the option of riding the bridge in Saint Nazaire. 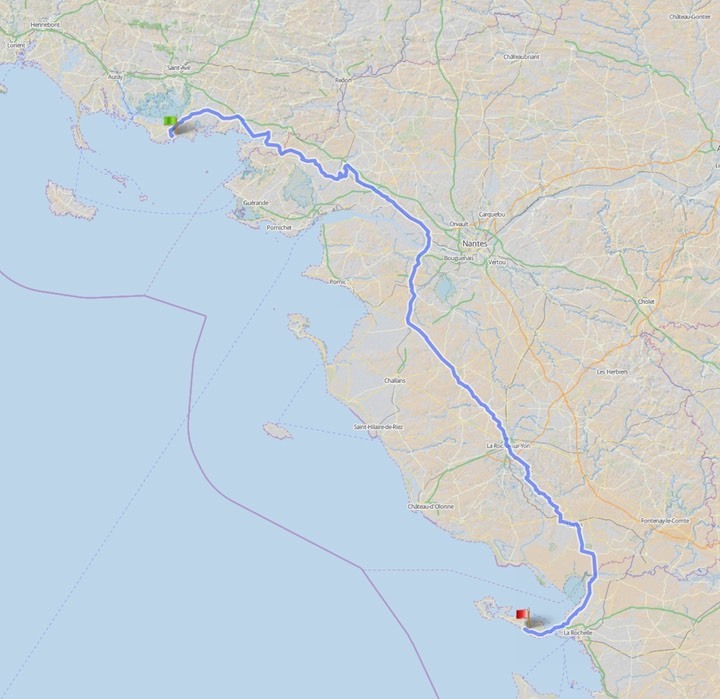 I have decided to stick with the reworked original (now 7 km shorter) because it has less traffic and the extra distance for not going via St Nazaire is only 10 km. However, I would still give you the choice of way this time. The file Denis from the French Velomobile Club has provided has a 280 km ride with about 1181 m of climbing, according to ridewithgps.com. On gpsies the same track has 1644 m. So much for climbing data. I have included it to the track list in the folder on gpsies. See the map on the right. 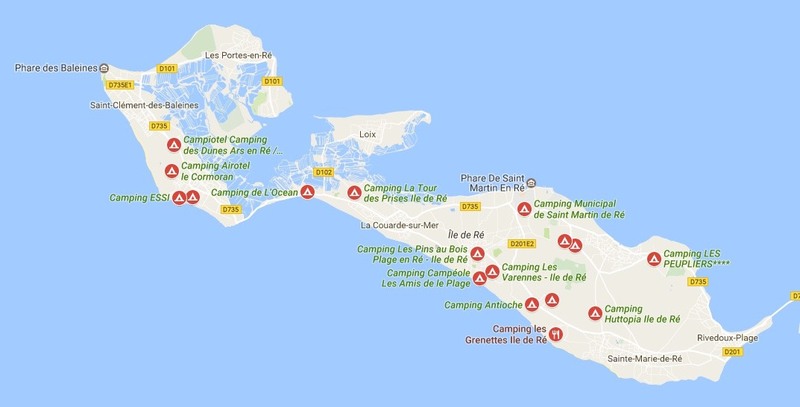 There are numerous campings on the island; we should be able to reserve one for us.